(PRLEAP.COM) December 24, 2014 - Versatex has released a new white paper designed to help contractors, architects and builders add some extra curb appeal and increase the value of any home construction project by using PVC trim and mouldings. PVC trim can be used on any home construction project, no matter how new or old the home the may be. Many builders opt to use PVC products for their home construction needs due to its high level of both durability and various benefits to the homeowner. PVC trim is the most popular alternative to wood trim, providing the same appearance without the risk of damage that wooden trim has. Plus, PVC products are virtually maintenance free, providing homeowners with an easy solution to help add curb appeal to their home. Another benefit of PVC trim is that it can be easily installed to change the look of any home. Whether you are looking to enhance the appearance of an older home or spruce up a new home construction project, PVC products allow builders both the design flexibility and versatility to be used in a variety of ways. Fascia, corners, skirt boards and band areas can all benefit from the use of modern PVC trimboard. Likewise, PVC mouldings can be used in a variety of areas as well. If you are looking to completely transform the look of a home's exterior, experimenting with different profiles can help create a variety of new looks for the home exterior. No matter where your home needs a boost in curb appeal, PVC trim and mouldings can be easily applied to upgrade and enhance the appearance of your home exterior. One of the top reasons that many builders and contractors elect to use PVC products is that they are impervious to rot, decay and insect damage with no need to add additional coats of paint or stain. Plus, cellular PVC products work great alongside a variety of home siding materials. No matter if you're working on a brand new home or looking to add some new life to an older home, PVC products make it easier than ever to add some extra curb appeal to your construction project. 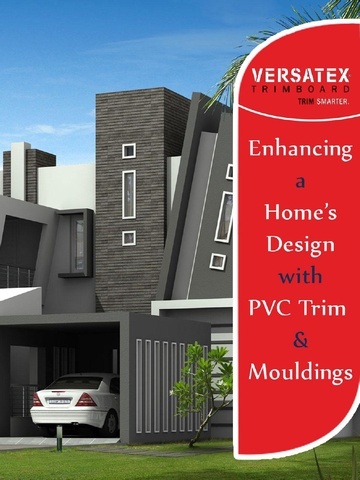 Learn all about the ways PVC trim and mouldings can be used to enhance a home's design by downloading Versatex's white paper at versatex.com/blog/2014/12/enhancing-homes-design-with-pvc-trim. At Versatex, our team is focused on helping builders, architects and contractors enhance their home construction projects with cellular PVC products that help to showcase a home's curb appeal and craftsmanship. With a wealth of building resources, technical help articles and installation videos, the PVC experts at Versatex allow their customers to trim smarter on all of their home project needs. Discover more about how Versatex products can enhance your home project by visiting versatex.com.